At Changi terminal 3, we were dropped off at the Singapore Air First Class Departure drop-off point. Check in was fuss free. 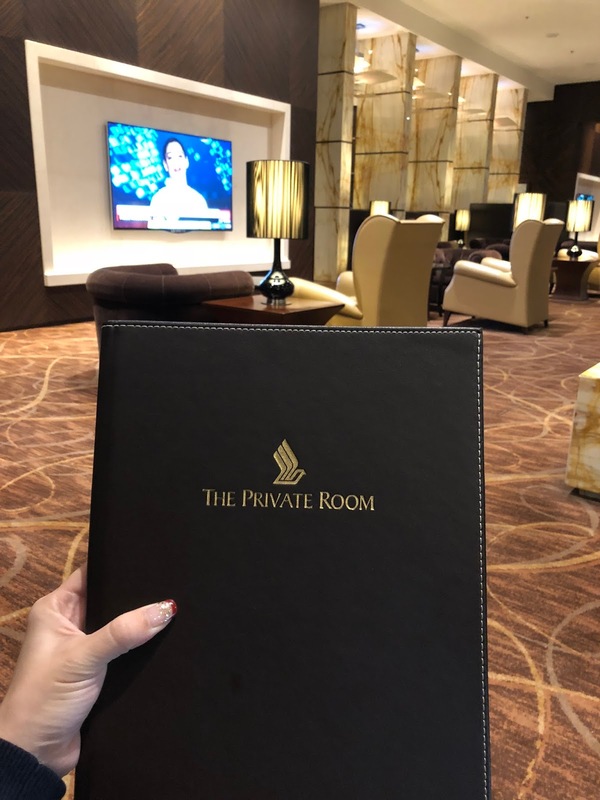 We were given our boarding pass and an invitation to the First Class Lounge - The Private Room. Feeling hungry, we went to The Private Room immediately. We were greeted and escorted to the Private Room. 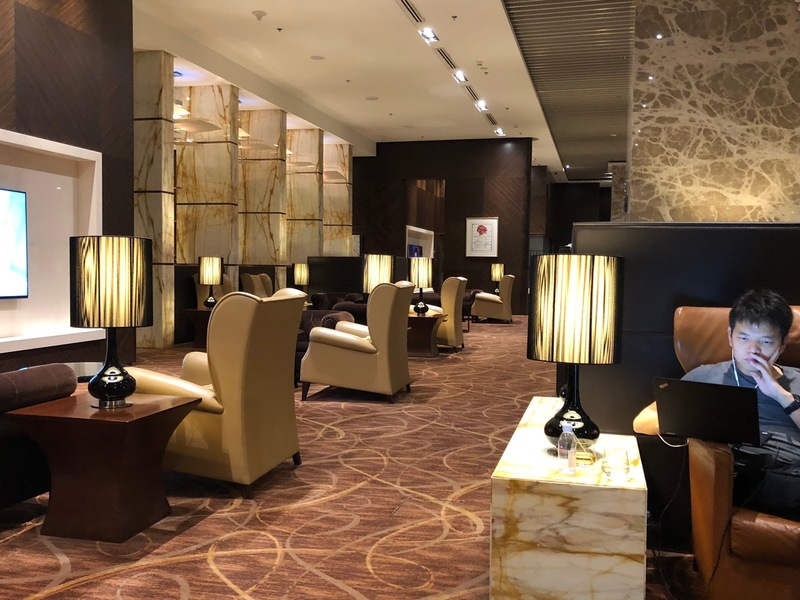 The room was located at the back of the lounge so guest could have a quieter experience. 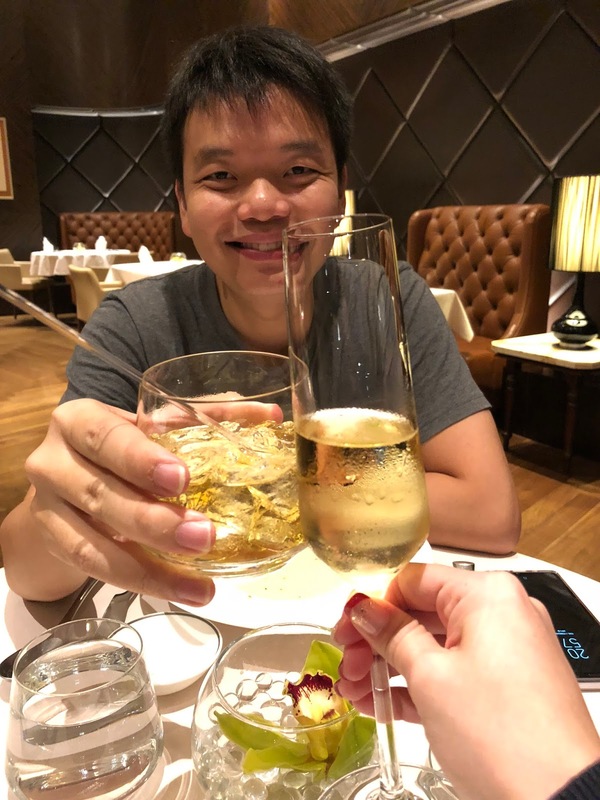 I had a glass of Krug Grand Cuvee and H had a glass of Johnny Walker Blue label to kick start the experience. While waiting for our food to be served, we went to the snack bar to grab some cheese and chocolate. 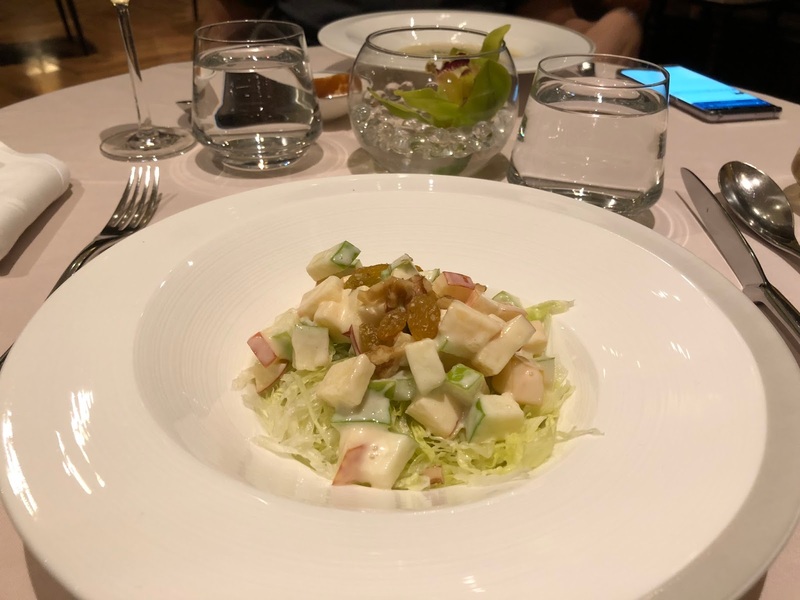 For starter, I had Waldorf Salad. It’s a combination of celery, walnuts, cut fruits and mayonnaise dressing. Honestly, the salad was not impressive. 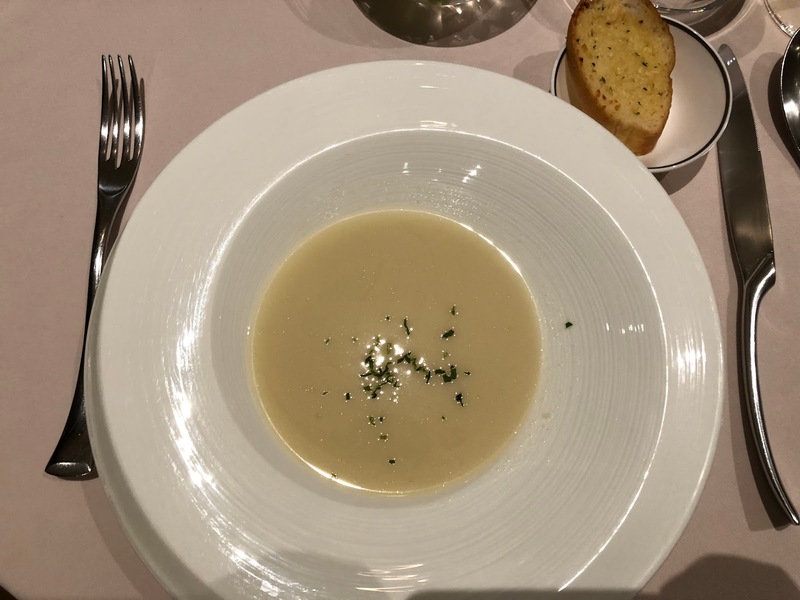 H had the western soup – cream of cauliflower with fennel seeds which H feels unimpressive too. H ordered the U.S Prime Beef Burger as his mains. The burger was juicy and perfectly done. Top with Portobello mushroom and onion jam, this got to be one of the best burger he had! Kudos to the chef that made his burger! I had the Baked Boston Lobster with three type of cheese. It was so good I had 2! The lobster was covered with a layer of cheese that crisp at the tip layer. The perfect combination between cheese and lobster. Yum! Still not satisfied, we ordered Satay to share. 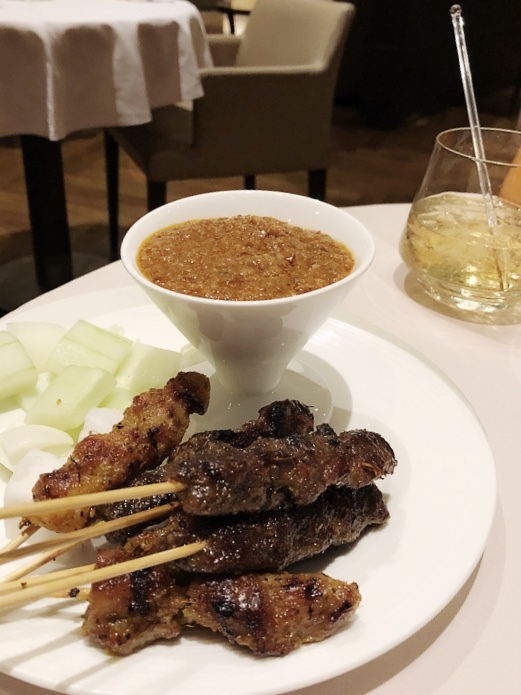 Although the taste of the satay was not as flavorful as the ones we had in hawker, the satay had chunk of meat on the sticks. Unlike those fatty satay meat we had, the ones served was lean and thick. 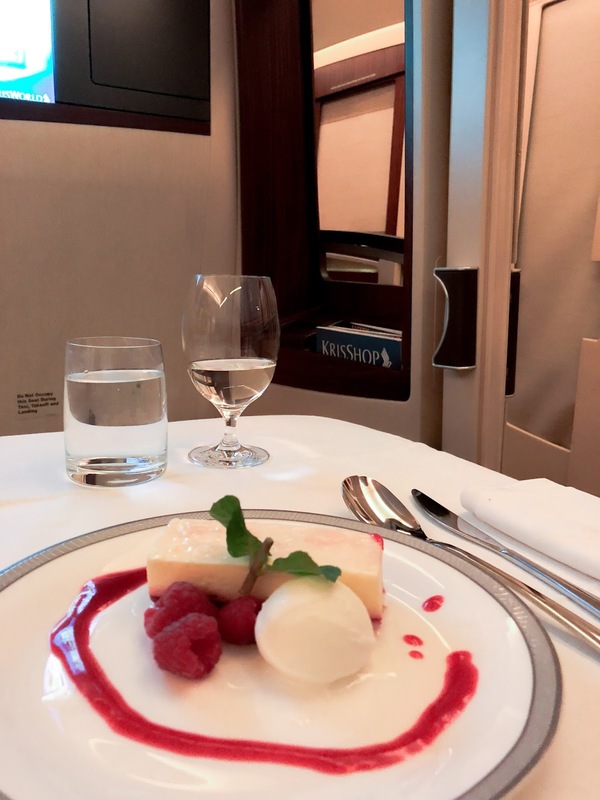 We skipped the dessert and save the space for our in-flight supper. After dinner, we waited at the lounge for our flight. It will be good if the lounge include work desk. Before I step into the aircraft, I was greeted by the air steward with mega-wide smiles. Wow. I have not introduced myself and they already know that I am coming. *insert brownie points* After boarding, they introduced themselves and help us to settle down. I love the leg space! We were given a stack of newspaper and magazine to choose from. Also, we were given Men & Ladies amenities pack. As It was way pass my bed time, I requested for a cup of blue mountain to keep me awake. 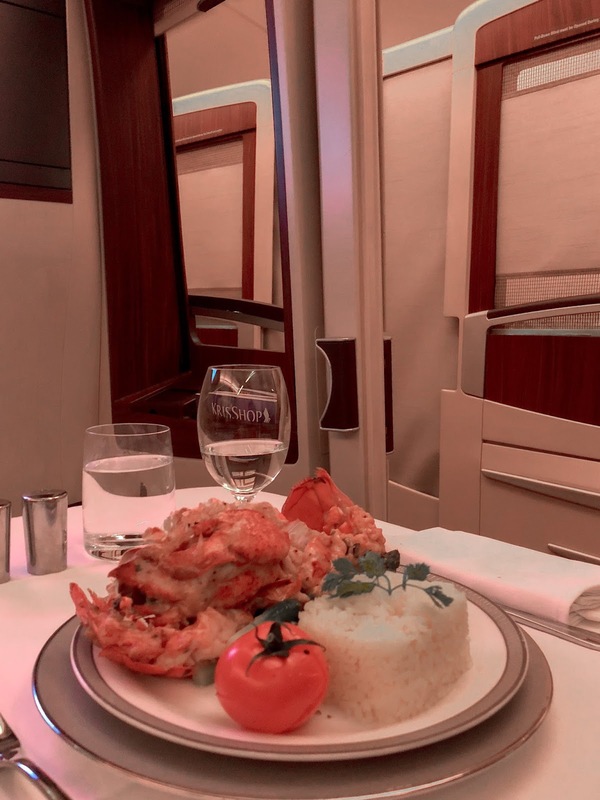 After the flight took off, supper was served. 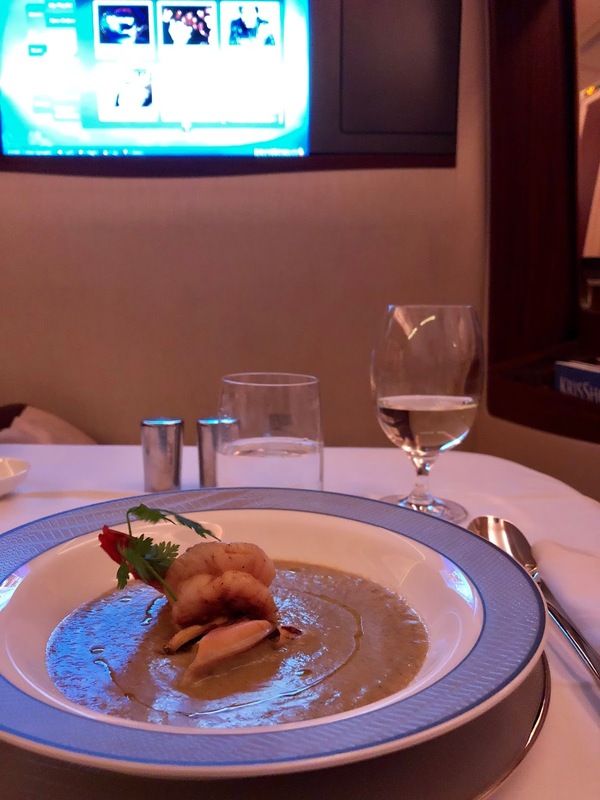 For the flight, the supper menu featured dishes recommended by three-star Michelin Chef Georges Blanc. For starter, we are offered The Farmyard Pate En Croute with Foie Gras and Mallossol Caviar and Marinated Lobster. We chose the Foie Gras as we had already pre-book our supper main for the Lobster Thermidor via the Book The Cook menu. Next for Soup, we had the Mussel and Mushroom Veloute. Both the Foie Gras and the Mussel and Mushroom Veloute are recommended by George Blanc. The soup is nice creamy and thick. It goes very well with the delicious bread from the bread basket offered. The Lobster Thermidor was supposed to be the highlight of the supper but we feel that it was pretty disappointing. The lobster was soggy, tastes funny and not as good as the Baked Lobster with Three Cheese we had at The Private Room. Not sure if the poor taste due to the altitude of the flight. After all, our taste bud changes when we are up in the sky. Dessert was good. Raspberry Tiramisu, top with white chocolate ice cream. 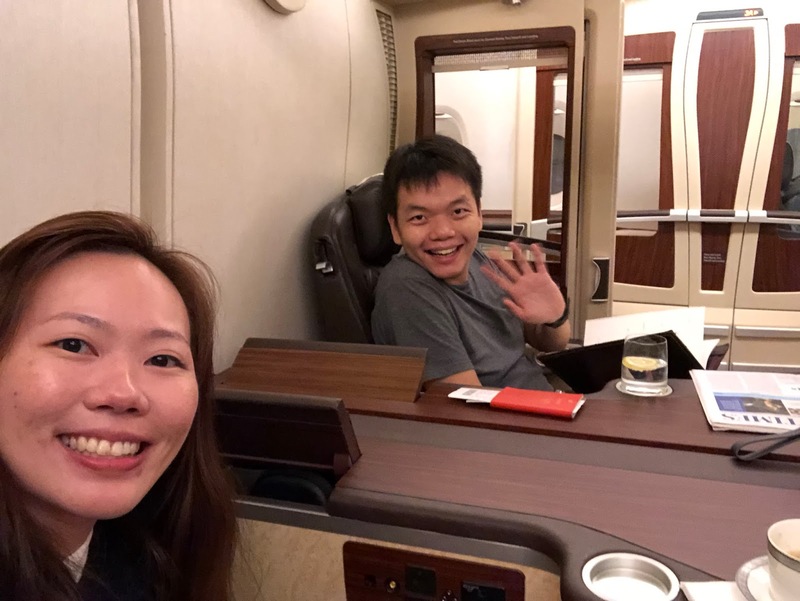 After supper, we changed into our PJ while the flight attendant helped us to convert our seats to a double bed. Lined with a layer of sheet on our seat, our bed was comfortable. Finally, My bed is ready! Yesss! It was almost 4am Singapore time and I was feeling exhausted. By 5 am, H finish his movie before turning in and I was already sleeping like a baby. H has again pre-booked the breakfast via the Book The Cook menu for the Kyo Kaiseki as we like Japanese food a lot. The Kyo Kaiseki Japanese breakfast came in 2 course. Firstly, the appetiser and then the main. The appetizer featured toufu, pickles, and vegetables in Yuzu sauce. Not a fan of tofu so I didn’t finish it. Plus, the appetiser was cold. H thought the toufu was nice and commented that it tastes like Yong-tau-fu. Then, the main was served. 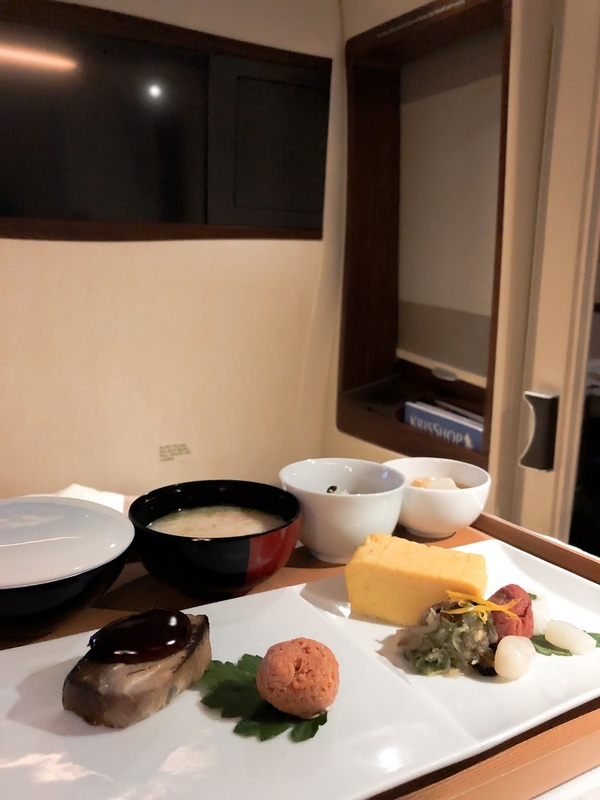 The main course features Tamagoyaki, Grilled Tuna with Teriyaki Sauce, Miso Soup with Sake, Cold Toufu, and some pickles. One can choose to have it with porridge or rice to go with it. The sake miso soup got to be my favourite. The fragrant taste of the sake goes really well with the miso, radish and toufu. H also likes the Grilled Tuna with Teriyaki Sauce and Tamagoyaki. His only gripe was that the top layer of his bowl of rice was dried and crusty and inedible. Luckily the bottom is good. 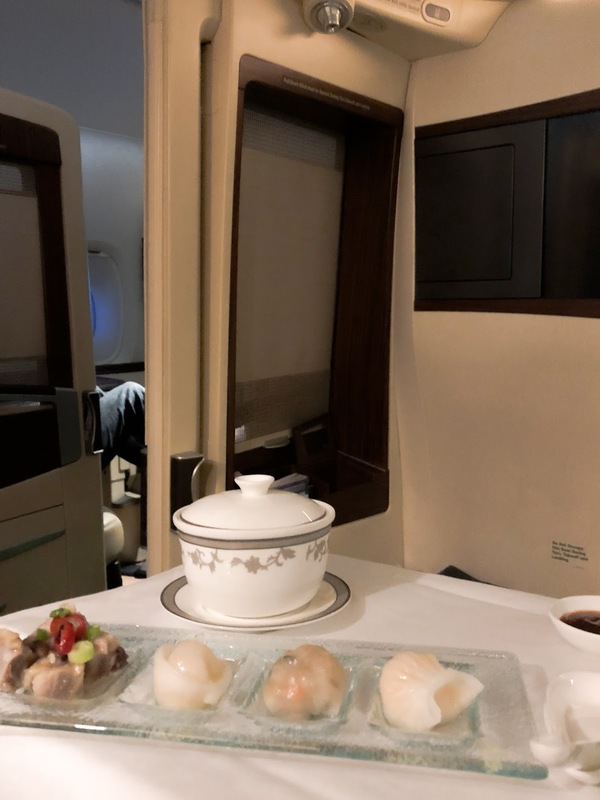 After our Kyo Kaiseki breakfast, the flight attendant checked if we would like to have more food. H decided to order the Dimsum set from the breakfast menu and I had the Cereal because the Kyo Kaiseki Breakfast was not very filling. The Dimsum set was served shortly and to our surprise, it was good! H especially liked the dumpling soup which was served hot and has crab meat and dried scallop in the dumping. 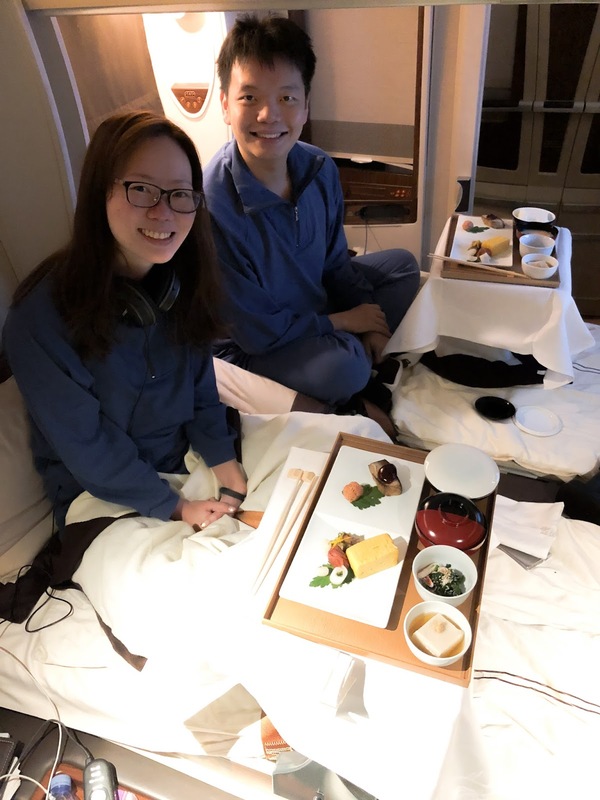 After we finished the breakfast, the flight attendant helped us to convert our bed to sit up position. Feeling very satisfied with the breakfast and wide-awake, we went back to work. 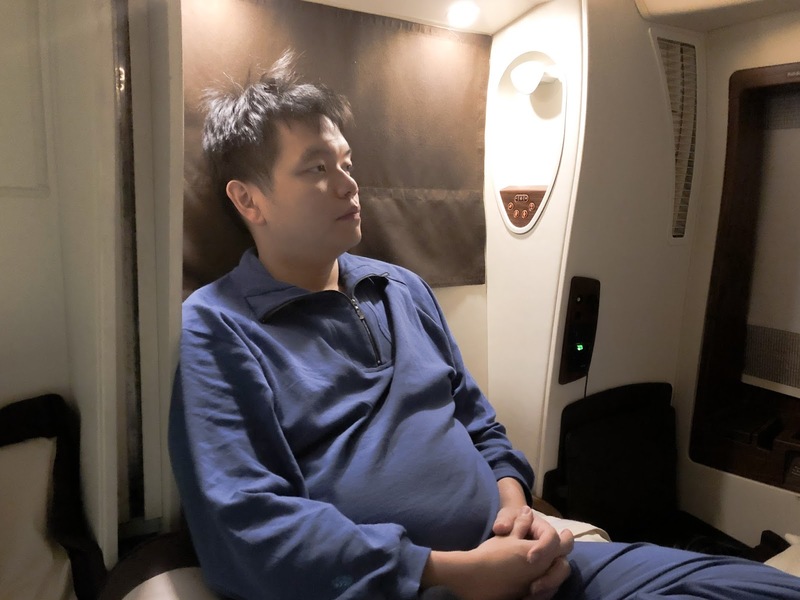 By then, I was very full and sad knowing that the flight experience is coming to an end. This got to be the best flight experience I ever had. Thank you H for including this as part of our honeymoon special. A little pity that i experience it with a very sick body. 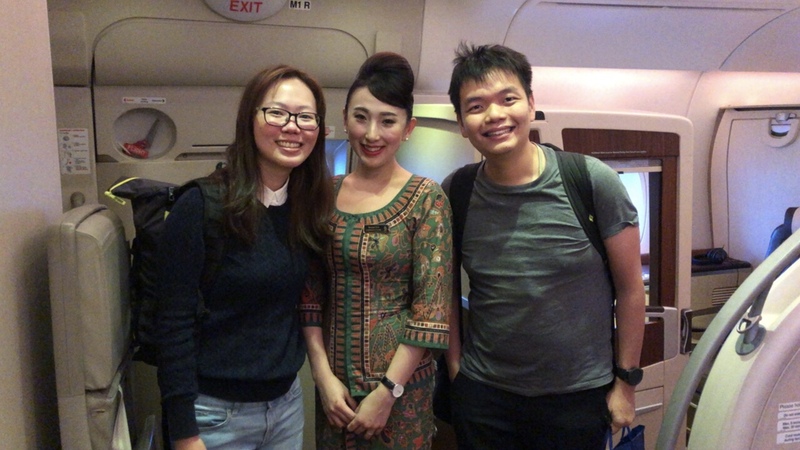 Nonetheless, i would like to thank the amazing crew that help us with our very first suite class experience with Singapore Airline.